The Family Centre works together in many different ways with individuals, businesses, and community groups to develop and implement projects in the community. Some projects are led by community and supported by The Family Centre, some are projects initiated by TFC or our Volunteer Leadership Group that are supported by others, and some are co-designed. Many have multiple partners working together towards the vision we all share. If you have an idea for a project or would to like to get involved, support or donate to an existing project please contact us. This project was initiated by our Executive Director, David Boutkan back in 2007. It has been supported through large donations from local clubs and smaller donations from individuals, community groups, and fundraising by our Volunteer Leadership Group. Many families in our area are under financial strain trying to pay basic living expenses, leaving no extra money for school camps, excursions and sporting activities. The Creating Opportunity Fund is used to assist families participating in our programs with the costs of school uniforms, school excursions, remedial tutoring, musical tuition and instruments, books, computer equipment, sports club fees and uniforms, travel and accommodation to events etc. Surf Dive n Ski initiated this project in response to our Youth Homeless Matters Campaign which ran in 2017-18 after the General Manager, Dave Keays heard young people speak on local radio about youth homelessness in the Tweed Shire, . The Ready for Work Program, a part of SDS Youth Projects initiative, offers young people participating in programs at The Family Centre the opportunity to work alongside experienced leaders in the SDS team. The 3-week program will see selected young people learn new skills, develop an understanding of how the business works and network with a variety of mentors. Ready for Work participants will gain skills and experience in the retail industry that will give them a step up to future employment. 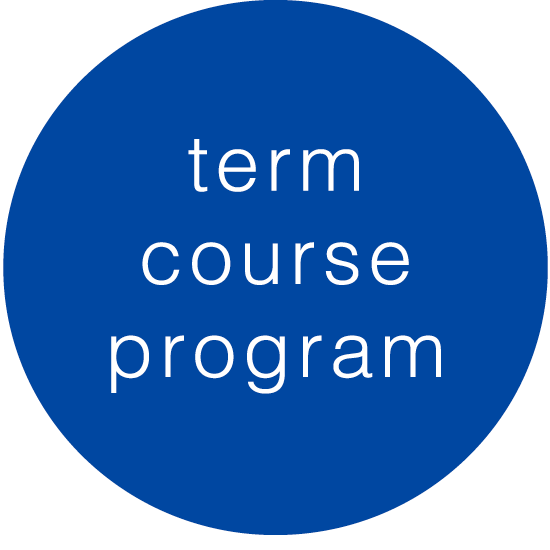 At the end of the program the young person will have a new resume and a certificate to recognise the competency based training they have completed plus the opportunity to continue with mentoring. Ready for Work kicks off in early May. The Respectful Relationships program grew as an extension from The Family Centre’s funded REALskills schools program at the request of local high schools. Funds were needed to keep it going however and over the years schools themselves, various community groups and businesses have supported the program to keep delivering. The program works with Year 10 students, in the five Tweed Shire public high schools, to explore and learn the skills that underpin respectful, positive and caring relationships. Since 1917 Commonwealth Bank employees have been supporting their local communities through one of Australia’s largest and longest running employee giving programs – Always Giving. 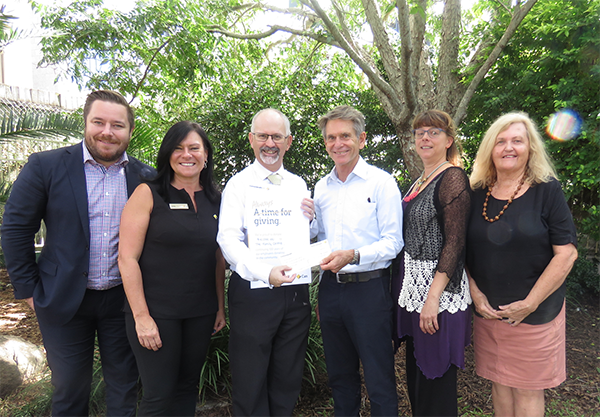 The Kingscliff Branch of the Commonwealth Bank has nominated The Family Centre to be the recipient of a $10,000 grant this year. The grant will make a difference to our local area and will be used to deliver the Respectful Relationships Program in local high schools. Thank you to the Michael, Brian, Jayne and the staff at Kingscliff Commonwealth Bank. Initiated by one of our Volunteer Leadership Group members, Kathleen Baldwin who approached the Men’s Shed for help designing and building the benches. Bunnings for providing the wood and paint for the students to paint the bench. Thank you to the team at Optus who donated $500 to the Buddy Bench project. The project builds, installs and paints Buddy Benches in collaboration with The Family Centre’s REALskills Primary Schools SuperMe program for Year 4-6 students. Four more benches are currently in the works. A group of concerned community members got together to form the community group, Seaside Shelter, with the aim of helping local homeless young people. They relocated a house from Kirra Hill on to a block of land provided by Tweed Shire Council. They now provide the house and ongoing maintenance at reasonable rent to house young people through our Connecting Home program. Seaside Shelter also donate funds towards other TFC programs. 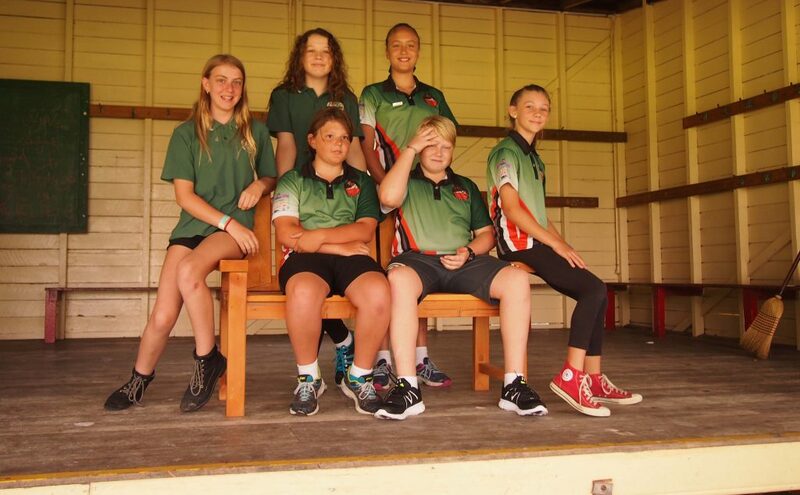 Oz Harvest representatives came to a Tweed Shire Youth Network meeting in 2015 to promote their service, collecting and distributing rescued food in the community. Our Connecting Home Coordinator, Gerina Appo saw an opportunity to help out those young people participating in our programs who were homeless or in need and set up the project . 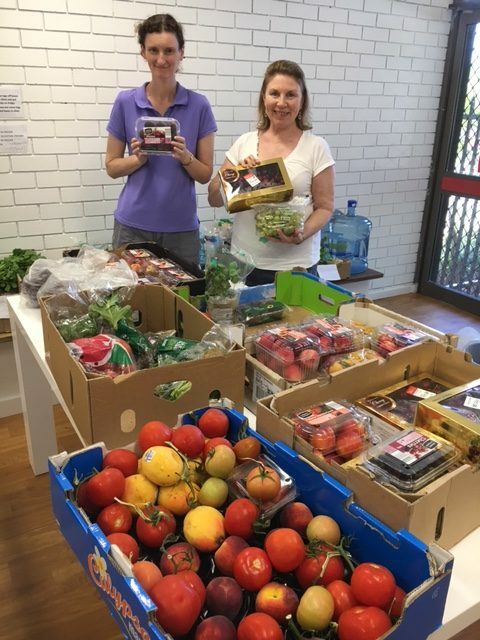 Oz Harvest delivers rescued food weekly to be packaged into hampers for families participating in our services. The Family Centres volunteers take extra care to create hampers that meet young people’s and family members individual needs and situations.which has now expanded to include families. For the past 3 years Cherry Street Bowls has donated the proceeds from Monday Bingo to The Domestic Violence Escape and Recovery Fund (DVERF). The DVERF assists women and their children experiencing domestic violence to escape or access financial support for their children, where they are financially unable to do so and other avenues of support have been exhausted. This project kicked off as part of our Youth Homelessness Matter’s campaign in 2017 and was a product of discussions between Tweed Mall and our Communications Coordinator. 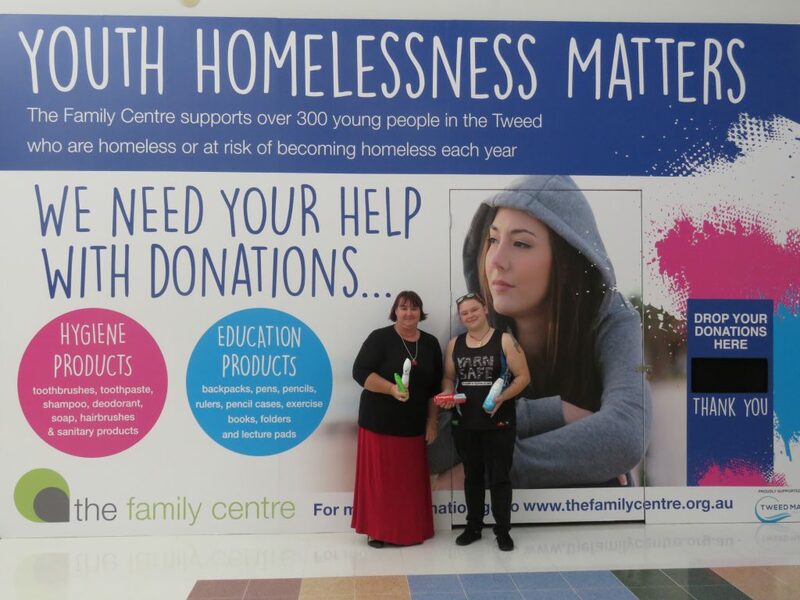 Tweed Mall provides a shopfront with a dropbox for local community members to drop off toiletries and other needs for young people who are homeless. The CWA ladies make toiletries bags and pack them up for distribution to young people and now to others in the community in need. Thanks to all the anonymous donors who drop off these goodies! Initiated by our Volunteer Leadership Group. The VLG buys children’s books with funds collected in Donation Boxes place in local businesses and the QBD bookshop provides a discounted rate for the books. The project gifts books to children who participate in child minding while parents are our attending courses, to children who attend playgroups, and to other children in families participating in our services. Home grown in the 2484 postcode area by local community members Carmen Stewart and Marlena Sue Basser who run Thrive 2484, It Takes a Town project receives philanthropic investment from Vincent Fairfax Foundation and support from a range of other partners and is auspiced by The Family Centre. The project works together with residents, services, clubs, churches, businesses, schools and government to create the opportunities and environments required for children to thrive. 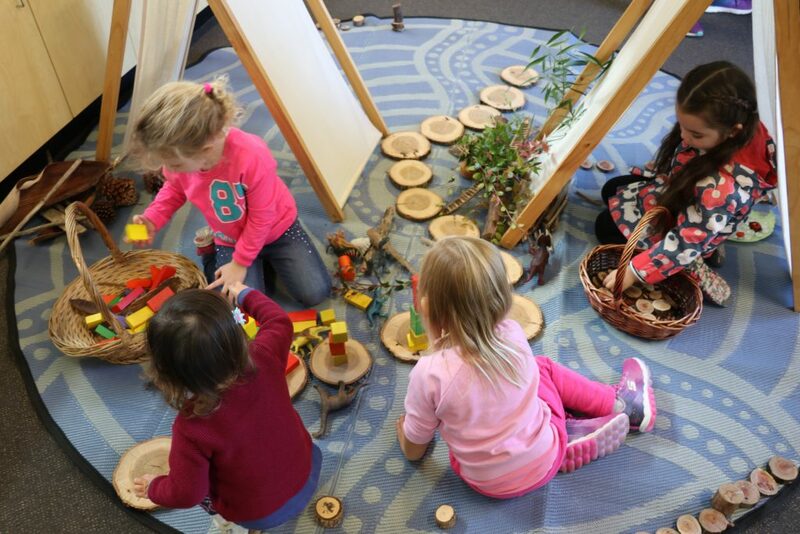 It does this through establishing Circles of Support around families, activating a common agenda that leads to more opportunities, projects and ‘good stuff’, for children and their families, and harnessing the generosity that already exists in our community. Find out more. One of our Ballina staff members brought the idea and his contacts with him from a previous job. Young people and their family members learn to sail and kayak at Denison Park at Shores Bay once or twice a year. Recycled Mats is a local company based in Tweed Heads South, started by JJ Stranan in 2009. Recycled Mats support fair, ethical and sustainable trading and manufacturing standards. They engage and support indigenous artists to create designs for their mats and homewares, and as a signatory to the Indigenous Art Code, are committed to ethical and transparent business dealings with Indigenous artists. JJ and her team were also keen to volunteer for The Family Centre joining our corporate volunteer program. In December 2018 her team participated in the Christmas Gift Wrapping. They plan to be active in up and coming volunteer events. JJ has also been very generous donating mats for events as well as gifting 40 rugs to families for Christmas and to young people in our Connecting Home program for their new homes.